For those uninitiated, day 1 of DreamHack is sometimes called ‘day 0’. There’s often few seeded players playing many matches while big name players mostly focus on sharpening their knives, ready to crush the worn out and weary BYOC players. For many of the Intel Pack4DreamHack players this first day is often the difference between a successful or disappointing event. They endure an 18 hour bus-ride, traveling throughout the night, only to arrive just before DreamHack opens. They set up and get ready to run the gauntlet to see how far they can stretch their tournament. It can be hit or miss. For example, among our packers are the LowLandLions Street Fighter 4 players Pr3y and MBR. They fell short early and were unable to leave their mark on the tournament. In their defense, the Street Fighter 4 player pool at DreamHack has been extremely strong this past year. However, every once in a while you hear a miracle story. A packer who defies the odds and proves themselves to be a force to be reckoned with. They might not play expecting to win the tournament, but they set out as mercenaries, looking to collect the scalps of well known players. This DreamHack Summer, Sjaak has shown just that. After going through as second in his group in the first group phase, he found himself placed in a group with HyuN, Huk and PengWin. 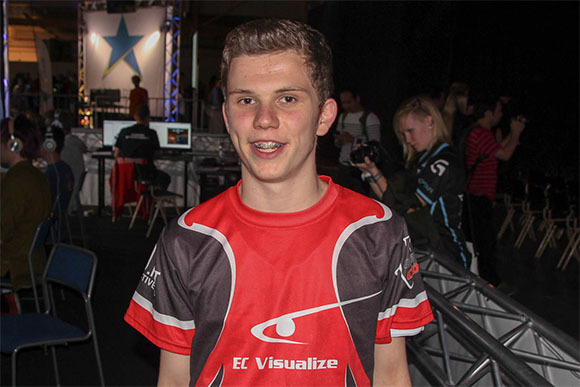 15 year old StarCraft 2 player Sjaak, representing ECV. To some, HyuN and Huk were seen as strong favorites to progress from that group. For Sjaak, they were two chances to prove he could take games from big name players. Beating one of these players would at least secure him third and some infamy. And so against the odds, Sjaak took down HyuN 2-1. Now some players would be happy with that. Sjaak wasn’t done though. Huk was up next, and with a decisive 2-0 victory, Sjaak knocked Huk down into losers. This means that as we speak either Huk, HyuN or both will be out of the tournament in their first group round! It is often said that the early rounds of a tournament require a different skill set. Favored players can get caught playing on autopilot, or not yet ready to defend themselves against an elimination that can only be 2 losses away. Let this be a tale of caution for those underestimating non-seeded players. Over the next few days, it’ll be my pleasure to keep you guys up to date on what is to come especially for our Dutch players and in the eSports tournaments at this edition of DreamHack Summer. We hope you enjoy the action and onslaught as much as we will!